Both links work OK for me, agreed, much nicer here, by far. Ayuh, I too was a life member, which probably means I'm dead and don't know it. Dallas recently had a cull, which I narrowly avoided. Else I would have been dead too. But then maybe I am? Is this the afterlife??? Whoops, OT. Thanks folks for the access feedback. Yes, Seapy is right - Dallas did have a cull earlier this year of old unused logins which I had forgotten about. I login occasionally, which is probably why I am OK. I will PM Øivind and see if he can open the two links to Jan Anne's original threads. The second link shows how he could use one of his EN-EL15 camera batteries to power his smart phone. Thanks Hugh. I have kept my Fotozone login to be able to access my old posts there, so I could access both of the links. Still looking though the information, right now drowning in open tabs from links in the posts. Birna, I have emailed you some .pdf archives. I tested opening the links in an incognito window in Chrome and I had access even there. 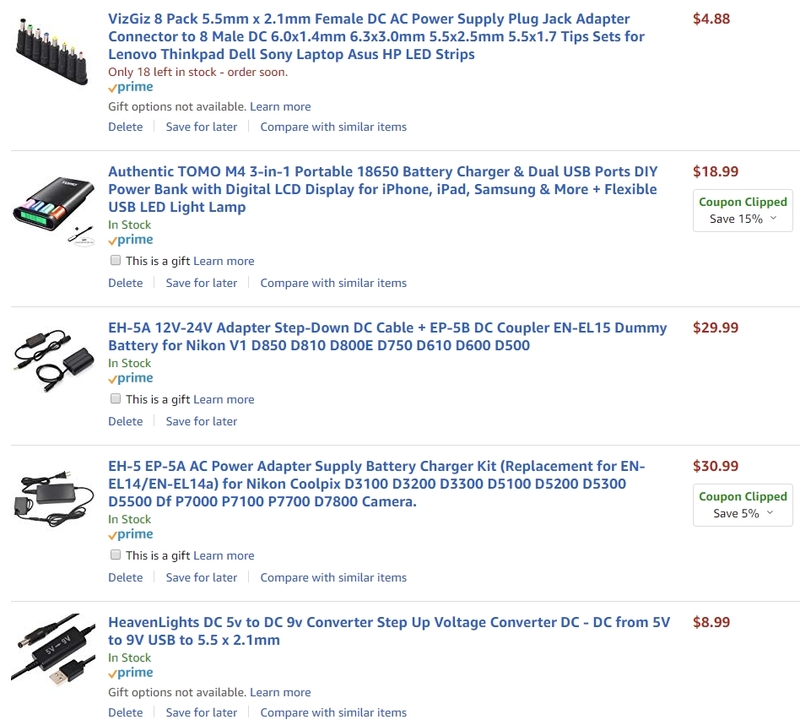 After looking through links I found that selections are limited for battery devices with 9V output that most of the battery adapters require. One of these is a series of devices referred to by Jan Anne, QIDIAN 1A/1.5A/2A/4A 6*18650 Mobile Power Bank Battery Charger Kit. The nice thing is that it is user replaceable 18650 batteries. I only found one that currently was in stock, the model almost at the bottom with 2600 mAh Sanyo batteries at $47.23. All other models out of stock or discontinued. This would give 57.7 Wh capacity, but the device is fairly big, 183x92x24.8mm, Weight 163g presumably without batteries. So it might not be ideal for travel. One could perhaps wait for a smaller model to be available, the 4 cell version with 3.4 Ah Panasonic batteries at $44.11 without power brick is out of stock and would likely be more ideal at 50.3 Wh capacity and 119.5 x 83.1 x 23.7 mm and 102 g for the case only. With the plethora of 5V battery banks available at various form factors and at lower prices, one could even afford to try out minimal solutions, and scale up if capacity needs appear to be higher, as long as the 2A current rating is present (which seems to be common). Considering the difficulty of shipping lithium batteries these days to the US, I would not consider any of the Qidian cases with batteries in the links above. If interest, I can provide details of what specific items I ordered once items have arrived and checked if they work. Hopefully I can get it all operative before the Geminid meteor shower Dec. 14. Geminid meteor shower Dec. 14. If you are handy with a soldering iron you could put 2 5V packs in series and then a 9V voltage regulator in-line. That would reduce the current draw on the batteries. While I no problems with soldering together stuff or even designing and building circuitry using electronic CAD (it usually gets more expensive than buying ready made stuff), serially connecting Li-Ion batteries without special controlling circuitry can be a risky affair - issues with balancing the discharge of the cells (although it might not lead to a disaster if adequate protection circuitry is present in the battery banks). It would be better to buy a bank with more batteries. Using DC- to DC converters is a safer way to provide the proper voltage. However I suspect the Tomo battery bank/charger that that has arrived to be adequate based on some preliminary current measurements. The bank takes 4 18650 cells - I got in the Panasonic 3.4 Ah cells from an ebay supplier yesterday (13.6 Ah total), and just charged them overnight+. I am currently testing their capacity with a USB LED lamp that only draws a pretty constant 270 mA, so I will know after 33 hours or so if the cells keep their nominal capacity or is a counterfeit with much less capacity... (A thermocouple logger that I previously designed records temperature of the lamp at 1 min intervals so that I know when it will cut out - a good sign so far is that it initially took more than 12h to charge the banks with a 1A power supply.) That would give me about 49 Wh of energy at room temperature, or with losses in the internal DC converter of the bank + the external 5V-9V DC converter (likely 2 x 5 % loss) about 46.5 Wh to the camera. The mornings of 13th and 14th December are forecast cloudy with rain or snow at my various vantage points in Northern England and Scotland. Agree re. adapting or coupling power banks, better to use correct, designed for the job power sources. The Tomo battery bank (13.6 Ah) that also can act as an 18650 battery charger was able to power each of D7100 and D5100 even in live view. The bank has a 2A output limit, but one can go somewhat above that before the short circuit protection kicks in and it shuts down. 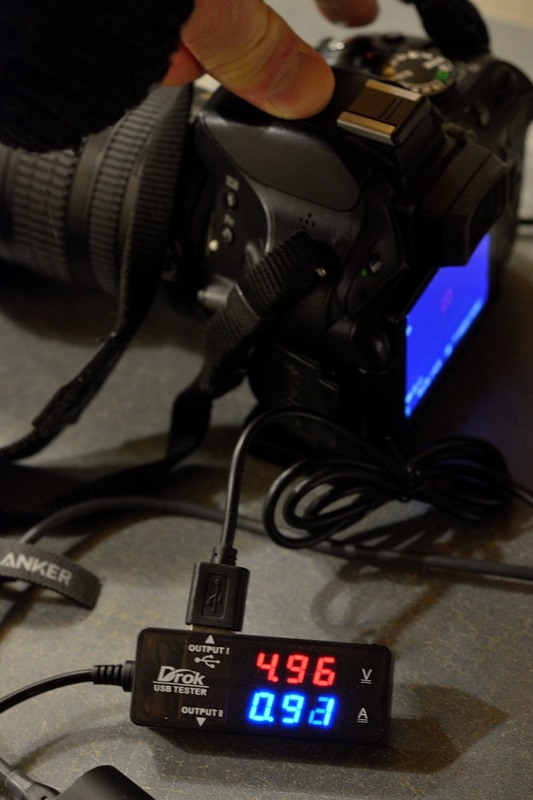 The current display fluctuates a bit and showed a little higher values than a dedicated USB power meter. 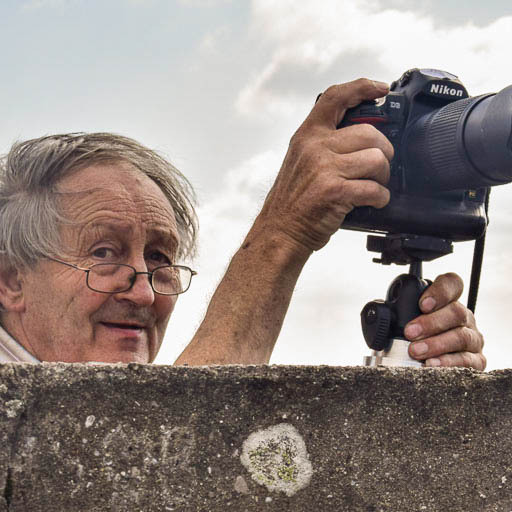 The current draw is not unsurprisingly higher on the D7100 than the D5100. For asto images I would not use live view except during aiming and focusing. Keep in mind that the actual current will be something near half of this after conversion to 9V with better than 95% efficiency. 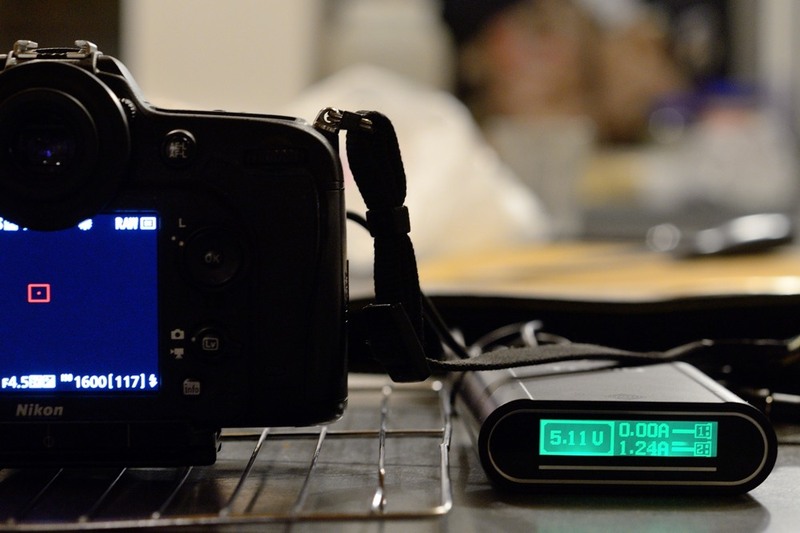 The first test test with the D5100 indicated no problems with powering it with 5 min exposures for >20 hours. But wait - when I downloaded the card there were 45 folders with image files on the card. What was going on? This is a characteristic of the D5100. If power is interrupted (for instance battery swap without turning power off first), it will forget all changes to the settings, including the number of the last image captured. So when power goes on again the image number will be a duplicate of an existing one, so a new folder is created. So not so good. (Captured though a window, it was -13°C outside). Last night I set up to directly measure the current draw of the two bodies by passing the 9V power supply though a 0.1 Ohm resistor and recording voltage drop with my DIY oscilloscope. 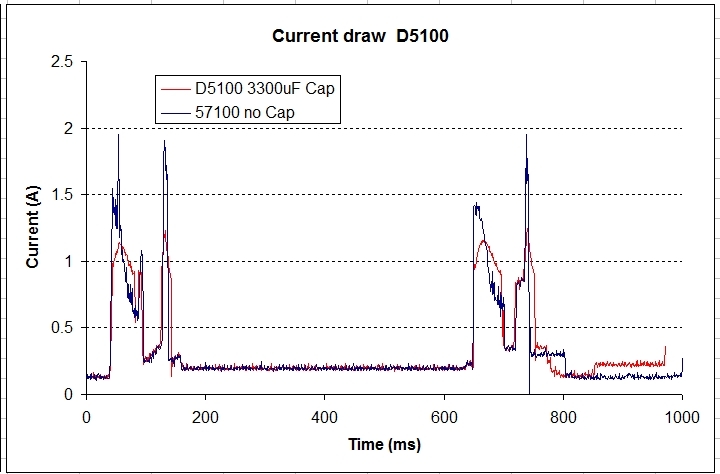 The red line is the same with a 3300uF capacitor across the power leads to smooth the peaks. Exposure time 0.5 seconds. First peaks is when mirror goes up, second when mirror goes down. 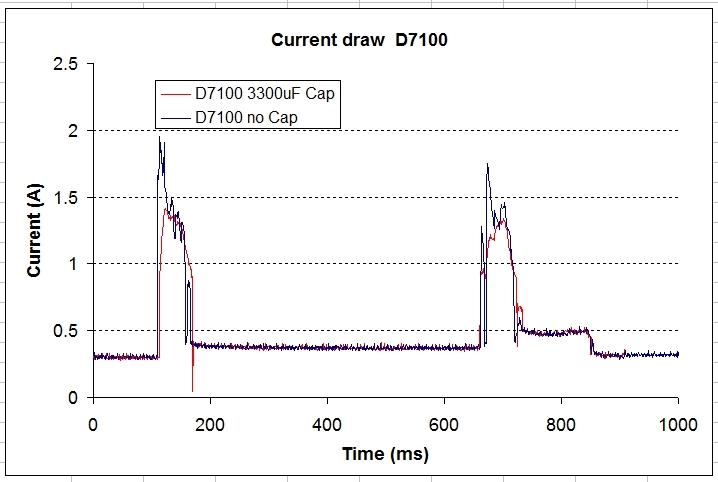 Idle current is about 0.3A, the mirror up peaks near 2A, then while shutter is open about 0.37A, new 2A peak when mirror is returned, and then fluctuating around 0.48A while image is written to SD card. Most important the high current draw during the mirror movement lasts 45-50 ms each. The capacitor helped to dampen the peaks but was not enough to keep current below the 1A output spec. of the DC-DC converter. A similar pattern with 2A peaks during mirror movements. However the high current periods last longer, about 95 ms and each consists of two peaks, which is even more problematic. 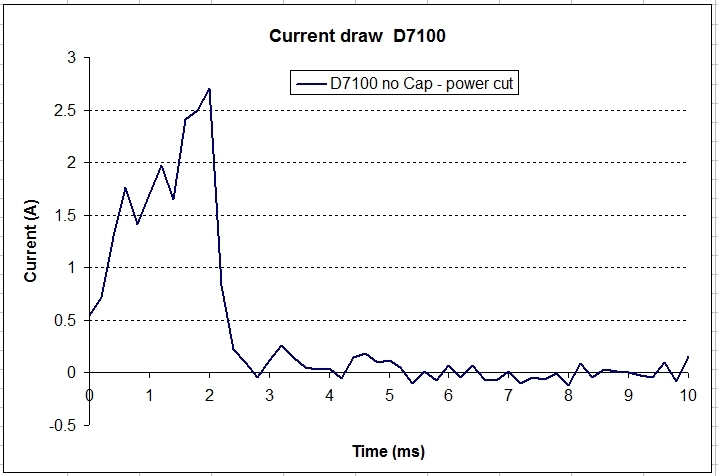 The idle current draw is lower though, about 0.14A and when shutter is open about 0.37A. The night of the Geminid meteor shower it magically cleared up after snowing before midnight. After my first experiences I had already decided to go for plan B, powering both cameras with AC power from a long extension cord which was available at the location. The two cameras were going though the night and collected 60GB of image data. 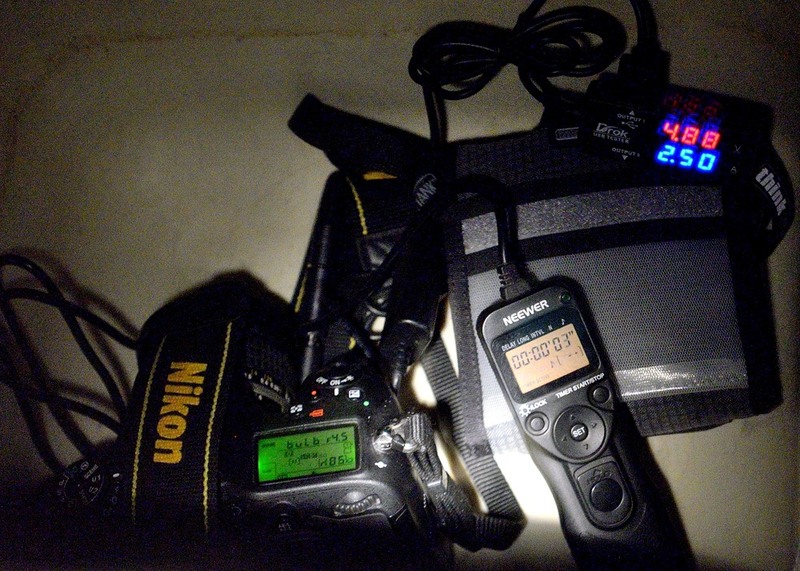 However the D5100 which was released with the internal timer tended to stop recording after less than 250 frames and had to be restarted in spite of the max number of frames set to 999. This did not appear to be a power problem though as there was no accumulation of image folders. For powering the cameras from the battery bank I am looking into adding a 1 F 9V super capacitor across the power leads. I will just have to figure out how to dampen the inrush current on first power up. So it looks like I will get use for my soldering skills after all. Very interesting Ølvind, will have to read again and again for it all to sink in but very interesting procedures and recording. Thank you for posting such detail. It seems I may have to modify my proposed creation because I don't think I will be using the D3 for star photography into the future, rather a D800 or D810 which is on the horizon. The battery voltage differs between the D3 and the D8XX. Your experiences will more directly relate to my project now, I think! I'm monitoring your posts with much interest, Øivind! That said, I would concern about the 1F super capacitor: wouldn't the initial current pouriing into the empty cap damage the battery?